A scenario when excess water or sewage is present in the basement of a home, typically either caused by a sewer backup or a drainage failure. Downspouts are the vertical pipe that allows the drainage of rooftop runoff to the ground. Homes typically have at least one or two, but may have many more depending on the size and number of roof drainage areas. Downspouts should be discharged to a lawn or other pervious surface for infiltration into the ground. It is illegal to have downspouts connected to the sanitary sewer system because of the additional load they place on the sanitary sewer and the added costs to the City to treat the water needlessly. A foundation drainage failure refers to one of two possible causes of basement flooding. When the drainage system(s) around the home or basement fails to prevent storm runoff or ground-water from entering the basement. The most commons causes of drainage failures are blocked, improper or inadequate foundation drainage, cracks in the foundation floor or walls, poor lot drainage, and failure of the sump and/or sump pump to handle flows. It results in relatively clean water entering the basement. The other general cause of basement flooding is a sewer backup. illegal connections to the sanitary system, including downspouts, sump pumps and foundation drainage. Extraneous flow is also referred to as excess water and “inflow & infiltration”. All buildings have a foundation, and most buildings have a foundation drainage system around and/or beneath it. In general, the systems are often comprised of layers of coarse gravel that permits easy flow of water, plus a perimeter pipe to drain collected groundwater, called a weeping tile, or drainage tile. Where feasible by gravity, the weeping tile will convey collected flows into either a i) soak-away area, ii) a storm lateral, or iii) illegally to the sanitary lateral. Where not feasible by gravity, the weeping tile will connect to a sump. If water accumulation in the sump is found to be excessive, sumps will be equipped with pumps to pump collected groundwater away to either i) a pervious surface area for re-infiltration (such as the lawn), ii) a storm lateral, or iii) illegally to the sanitary lateral. Grading refers to the slope of the land and landscaping around your home. To promote water movement away from the house, grading must be sloped away from the house, with no depressions or low-lying areas adjacent to the home. Water flows by gravity – downhill – and if the land doesn’t slope away from your home, water will flow towards it and a flood risk is then present. All of these connections put other-wise clean water into the sanitary sewer, than then requires pumping, conveyance and treatment, and occupies valuable capacity in the sewer collection and treatment system. 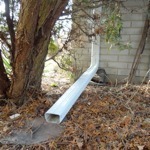 The lateral is a pipe that connects the plumbing in your home to the sewer mains on the street, that allow flows to be conveyed away from your property. All homes have sanitary sewer laterals, that connect your plumbing to the sanitary sewer mains within the road right-of-way. Some newer homes also have storm sewer laterals, that may allow for drainage of foundations, sumps and/or rooftops. All laterals are jointly owned. The property owner owns and is responsible for maintaining the lateral from the property line to the building. The Municipality is responsible for maintaining the lateral from the property line to the sewer main. A sewer backup refers to one of two types of basement flooding; a scenario when a pipe connection to your home is blocked or backwatered, and the source of flooding is the plumbing or pipe itself. This typically presents itself as water/sewage originating from fixtures tied to the sanitary sewer laterals, including the floor drain, toilets, sinks, showers and laundry fixtures located in the basement. This is one of two types of basement flooding, the other generally characterized as drainage failure by storm-runoff and/or groundwater. A sump is a hole in your basement floor or foundation where local groundwater around the foundation is intentionally designed to accumulate. Some sumps are dry all the time. Some sumps are wet all the time. 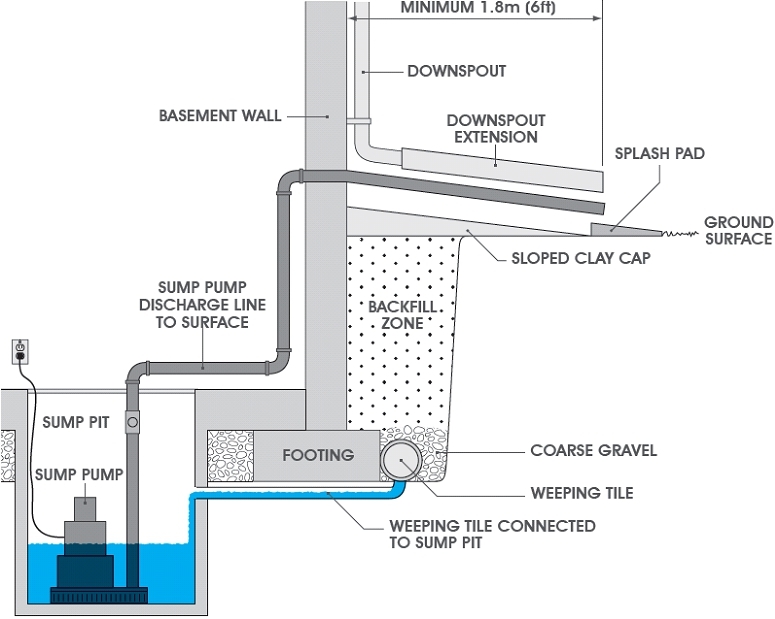 Some sumps require constant pumping to keep the groundwater level below the basement floor level. 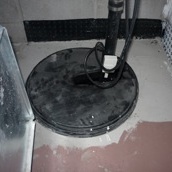 A sump pump sits in the sump and pumps out water so the home does not flood. There are different varieties of sump pumps available. A sump pump should have backup power available to it, or a power source that is available when there is a power outage. More than one sump pump may be required in certain circumstances, when incoming flows exceed the capacity of one pump. Sump pumps need to be maintained. A weeping tile is a perforated pipe that runs around the perimeter of your foundation to intercept groundwater. The weeping tile gives the groundwater a place to go. Where it goes depends on the type of foundation drainage system your home was built with. Take a look at foundation drainage for more detail.